Your Tropical Paradise Holiday starts right here 12 Boutique Beachfront Apartments directly opposite the palm-fringed, crescent-shaped, golden sands of Trinity Beach on Vasey Esplanade. Your spacious apartment is fully equipped with your balcony overlooking the beach with 1, 2 or 3 Bedrooms. Cool Terracotta tiles line the floor, fully air-conditioned for your comfort, wireless broadband available in every apartment, Austar, lift access and so much more. Relax by the pool, solar heated in winter, or enjoy a family BBQ in our back yard jungle garden. Youre just a minute away from a host of award winning restaurants and the unique village atmosphere that is Trinity Beach. Your on-site residence managers, Barb and Ian, hold a vast knowledge of the local area and best trips and will personally welcome you to your Boutique Trinity Waters experience. Whatever you wish to do can be arranged Personal transfers from Cairns Airport with flight details, hire cars are available within Trinity Beach and all tours and trips provide pickups to and from Trinity Beach. Let us help you have a memorable holiday and we look forward to hearing from you and welcoming you to Trinity Waters Boutique Beachfront Holiday Apartments. Absolute Beachfront, Self-contained Apts, 10 Secs walk to Beach & Restaurants, Balcony over-looking Beach, Lift, Internet, Austar, Air-cons, cool tiles, ceiling fans, Heated Pool & Spa, BBQs & Tropical Gardens with Gazebo for entertaining. Rates are for 2 people. Extra adults $25.00. Extra children $25.00. The room caters for a maximum of 3 adults, and a maximum of 2 children but cannot exceed 3 guests in total. Available bedding configurations 1 double OR 2 singles OR +$25.00 1 double and 1 single OR +$25.00 3 singles. Absolute Beachfront, Self-contained Apts, 10 Secs walk to Beach & Restaurants, Balcony over-looking Beach, 2 Bathrooms, Lift, Internet, Austar, Air-cons, cool tiles, ceiling fans, Heated Pool & Spa, BBQs & Tropical Gardens with Gazebo for entertaining. Rates are for 4 people. Extra adults $25.00. Extra children $25.00. The room caters for a maximum of 5 adults, and a maximum of 4 children but cannot exceed 5 guests in total. Available bedding configurations 2 doubles OR 1 double and 2 singles OR 4 singles OR +$25.00 2 doubles and 1 single OR +$25.00 1 double and 3 singles. Absolute Beachfront, Self-contained Apts, 10 Secs walk to Beach & Restaurants, Balcony over-looking Beach, 2 Bathrooms, Lift, Internet, Austar, Air-cons, cool tiles, ceiling fans, Heated Pool & Spa, BBQs & Tropical Gardens with Gazebo for entertaining. Rates are for 6 people. Extra adults $25.00. Extra children $25.00. The room caters for a maximum of 7 adults, and a maximum of 6 children but cannot exceed 7 guests in total. Available bedding configurations 2 doubles and 2 singles OR 1 double and 4 singles OR +$25.00 2 doubles and 3 singles OR +$25.00 1 double and 5 singles. We have Fax and Photocopying facilities from the Reception Area and all Apartments have direct dial ISD/STD Phones and Wireless Access. Reception is open during normal Business Hours - Please advise info@trinitywaters.com.au if you will be arriving in the Evening so we can pre-arrange your Check-in. Trinity Waters features undercover Security Parking with a lift to all floors for your ease and convenience. 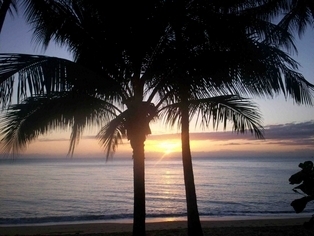 Cairns Beachfront Apartments by Trinity Waters are only 30 minutes from Cairns CBD and 20 minutes from the international and domestic airport. Our public bus service is merely minutes away. Enjoy breath taking Beachfront views from your own private Balcony or take in the local atmosphere dining at any one of Trinity Beachs Beachfront Cafes and Restaurants - its just a leisurely stroll along the Beach. We even have a restaurant right next door. Trinity Waters is conveniently located to public transport and were only a 10 minute walk to Coastwatcher Shopping Centre (an excellent variety of shops). It you don't feel like walking we will drive you there and they will bring you back free of charge. We are a 5 minute drive to one of the Best Professional Golf Courses and we even have lawn bowls. Simply enquire at Reception for all your tour requirements - we will watch the weather for you and you can snorkel or dive the Great Barrier Reef, visit the World Heritage Rainforest, or explore the Atherton Tablelands with your own rent a car. Or if that sounds like too much work, just wander across to the Beach and relax under shady palm trees. There is something for everyone.